Bacon and eggs are a popular Aussie tradition and you probably won't find many people turn down the offer of crispy bacon, fried eggs and hot buttered toast on a Sunday morning. Until recently I faithfully chose the all-day breakfast whenever dining out in the morning. In my opinion you can't beat the old favourite - bacon, eggs, tomato, toast and a hash brown on the side. Since it's practically my favourite meal imagine my surprise when a friend told me about another variation of bacon and eggs, which is actually, (after some considerable doubt on my part), surprisingly tasty. Some of you may have heard of Canadian Bacon and Eggs. Basically you swap the piece of toast for a maple syrup covered pancake. The thought of bacon, eggs, hot pancakes and maple syrup is strange I know (or maybe not for some) but wait until you try it. I was reluctant at first though seeing as bacon and eggs were involved I decided to take the plunge. Wow – an explosion of deliciousness I can't find words to describe. I may be biased, I know, but it's definitely a recipe I recommend. It's really simple to make and takes about 15 minutes to prepare. 1 x Shake 'N Pour Pancake Mixture from your local supermarket. 1. Turn the oven onto a low temperature. 2. Turn your frypan on medium heat and add a teaspoon of butter. 3. When heated place in your bacon. Cook to crispy (or whichever way you like). 4. When bacon is nearly ready put to the side and crack an egg into the frypan. 5. When both bacon and egg is cooked place into the oven for heating. 6. Add the required amount of water to your Shake 'N Pour Pancake mixture (check the label on your bottle for measurements). Shake well. 7. Pour a decent sized pancake into the heated frypan. Flip over when bubbles arise on the surface. When slightly brown remove from pan onto your serving plate. 8. Coat your pancake with desired amount of butter and/or maple syrup. Grab the bacon and egg from the oven and add to your serving plate. Enjoy. NOTE: You can make your pancakes from scratch if you prefer. There are some good basic pancake recipes on www.taste.com.au. 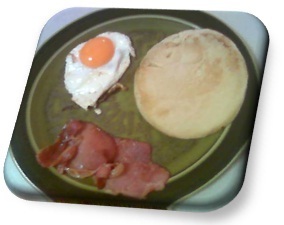 The bacon, egg and pancake can all be eaten separately if you choose, however, it's much more tantalising to combine all three ingredients into one mouthful.